Any form of business activity involves sets of interlinking processes. To ensure that all customers get what they want when they want it and that these complex interlinking processes are done correctly, Epec deploys a Quality Management Systems approach. To be successful, teams working on a particular process must know what the job requires. At Epec we strive to clearly define our processes to reflect our customers’ needs. This enables everyone involved to understand their role when dealing with contingencies. The logistics involved in our global supply chain are quite complex. Epec uses a variety of advanced training methods to ensure that team members understand their role as wells as customers’ requirements so that we execute flawlessly through all types of adversity. We enforce the rules that guarantee quality product, but allow innovation and flexibility in servicing our customers. Epec records all actions taken in our ERP system, so that all those involved know the current position, what has gone on before and what still needs to be done. Records are regularly reviewed both to ensure delivery targets can be met and to identify any problem areas. When Epec identifies problems or potential problems we deploy tiger teams to eliminate or alleviate problems. All companies talk about quality but very few back it up with true investment in people, systems, equipment, technology and processes. Listed below are just a few examples of areas where Epec has invested heavily in order to assure that our customers get the quality experience that they deserve. The Epec quality assurance process is divided into five separate areas, ensuring that specialized expertise is applied to each stage of our business process. Epec’s system also provides the safeguards necessary to prevent any quality problem from evading detection. The quality of our people dictate the quality of the Epec customer experience and we don’t get great quality people without training and investment. Training – All Epec employees are required to be up to date on all in-house training requirements as indicated by the training matrix for their job description. Certifications – many Epec employees have certifications for their specific jobs. For example, all of our printed circuit board or cable assembly inspectors worldwide hold IPC certification. Technical Expertise – In all of products we have extensive in-house technical expertise from our PCB CAM engineers, to our Battery Tech Center in Denver and our Product Managers who travel the country to meet with customers to design the best in class products. This is our approach to how we manage our business in order to assure we exceed our customers’ expectations as we have grown from a small regional company to a large global brand. Continuous Improvement – No company does things perfectly, but you can judge how serious a company is by how much visibility and importance is put on continuous improvement. Every employee at Epec has a goal to be involved in at least one A3 improvement project every year. Supply Chain – Suppliers don’t just fall out of the sky and they don’t perform at a high level without active customer participation and continuous involvement. While 20% of Epec’s product is made at our domestic factories, 80% is made in lower cost regions in Asia - due to cost pressures that our customers have on their end product. Our active management includes 20 direct employees in China and 30-40 visits to suppliers. Continual supplier visits every year by quality, supply chain, sales and management personnel. 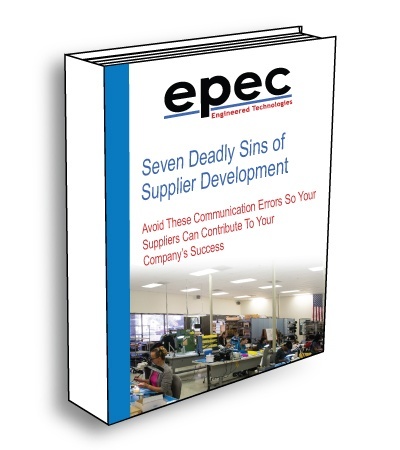 Processes – Nothing at Epec is left to chance. Epec works hard at every functional level to make sure that every process is defined and work instruction is documented so that we can consistently provide the same top-notch products and services to our customers. As we are a manufacturer and value-added distributor, it may surprise you to know that that Epec has made significant investment in equipment in our factories in the US and Asia in order to meet customer expectations. Many competitors just don’t have the financial strength to invest in the latest technology to assure quality. Quality Control – Epec invested $80,000 in x-ray fluorescent equipment for material analysis, so we can assure in-spec metal thickness and RoHs compliance. Most customers do not have the resources to do things in-house. We take on the responsibility to ensure that every customer gets exactly what they need. Denver Battery Tech Center – At our Battery Tech Center we have all of the state of the art equipment to design, build and test industry leading technology of battery packs. So whether we build the final product at our plant in Boston, or it must be built in Asia due to cost constraints, Epec’s customers can be sure that we have the resources and facilities to support their every need and quickly respond to any problem. Too many companies still work from paper and spreadsheet based systems. Epec has invested heavily in IT to work through a paperless system that makes sure that all of the data is always in the same place and stored the same way, regardless of where the product is being made. Software – Investing in state of the art systems like NetSuite, Autodesk’s PLM 360, and Box.com gives Epec a competitive advantage in the marketplace. These tools allow us to deliver product faster, make ECO and other changes more consistently and provide company wide continuity. IT Infrastructure – Epec always strives to be an industry leader when it comes to IT tools. It starts with our industry leading InstantPCBQuote on-line order management program, our disaster recovery planning, equipping all of our employees with cell phones to ensure that we are able to communicate with customers and factories at any time or anywhere they may be. Need to talk to our someone from our Quality Department? Send us an email and we will contact you shortly.